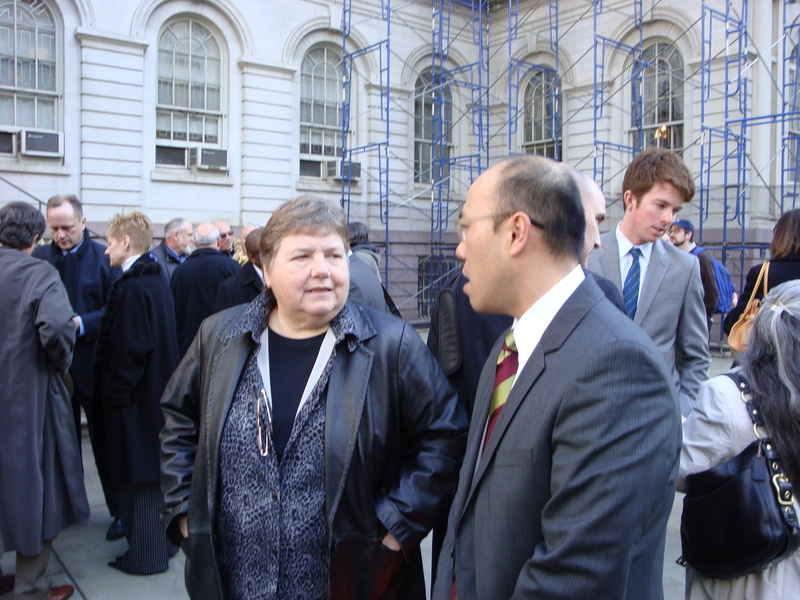 Irene LoRe, executive director of the 5th Avenue BID, and Carl Hum, president of the Brooklyn Chamber of Commerce after the City Hall press conference. Small business owners from across the five boroughs of New York City, chambers of commerce, non-profit organizations, trade associations and more gathered on the steps of City Hall to speak out against the New York City Council’s proposed Paid Sick Time bill (Intro No 1059). The group, representing an unprecedented and diverse coalition, says the bill will hurt the city’s economy and local businesses. “While Intro No 1059 is well-intentioned, its impact, both short and long term, will be damaging to the business community to the tune of about two to three billion dollars in new costs. Our business and non-profit communities are trying to weather current economic challenges, maintain current levels and look toward future growth through job creation, yet they are being asked to shoulder this latest burden,” said Jack Freidman, Queens Chamber of Commerce. “How can the City’s business community compete when they are at such a disadvantage?” he added. “Our printing company has 32 full-time employees. We currently offer six paid sick days and forcing us to offer nine paid sick days will cost our business another $30,000 per year and that will be a burden on our company which is challenged by this current economy. I will have to cut down on their vacation time to cover these costs,” states KY Chow, GM Printing in Long Island City. In addition, other businesses have indicated that they will scale back on other benefits as well as reconsider new hires and expansion plans. New York City’s employers have already cut overhead, payroll, and services in response to the current economic crisis; add to these increased taxes (including the new mobility tax), water rates, electricity rates, real estate taxes and fines and fees and it is clear how New York came to be ranked 49th out of the nation’s 50 states in business friendliness. “This bill is not just about the ability for workers to have mandated paid sick days. We hope the City Council will think of this as they consider Intro No 1059, and look to strengthen current city departments to handle the complaints of those workers who are actually experiencing employment problems instead of punishing the entire business community and creating more burdens on the very businesses that are striving to maintain and provide jobs in the first place,” states Manhattan Chamber of Commerce President Nancy Ploeger. Proponents of the bill point to San Francisco as a model for implementing Intro No 1059, when in fact that city’s legislation took more than seven months to implement because of confusion; San Francisco’s labor law enforcement agency was forced to seek additional staff and funding because current levels are inadequate to enforce the legislation – New York City has no such agency; and, most importantly, a formal evaluation of that city’s law is yet to be conducted. “This bill isn’t a public health bill, it’s a bill about the future of New York City’s economic development and growth, ability to provide jobs and the viability of a strong business community,” said Robert Bookman, counsel, New York Restaurant Association. “You can’t punish an entire community for the acts of a few. We hope the City Council will think of this as they consider Intro No 1059,” he added. This entry was posted in Government, Politics, Small Business. Bookmark the permalink.